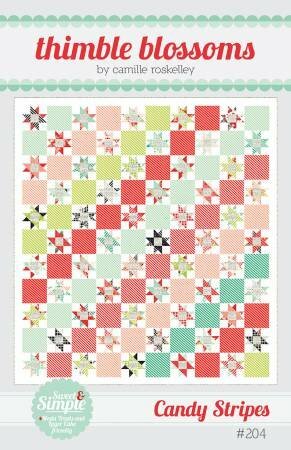 Candy Stripes by Thimble Blossoms Quilt Pattern TB204 by Camille Roskelley. Layer Cake Friendly. Features Handmade Fabric Collection by Bonnie & Camille for Moda. Quilt Size 64" x 70" A sweet star pattern with colorful stripes.